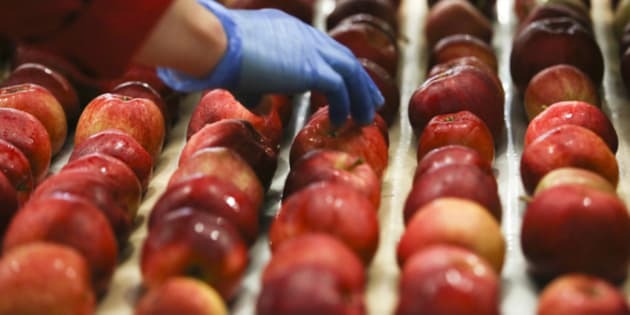 Some Granny Smith and Gala apples sold in parts of Canada are being recalled because of possible listeria contamination. The apples were exported by Bidart Bros. in the United States. They were sold in Ontario, Quebec, Nova Scotia and Newfoundland and Labrador. The affected produce was sold under the brand names Big B and Granny&apos;s Best. It&apos;s possible the apples were sold under other brand names or not branded and sold loose o in bulk. CFIA recommends throwing out the apples or returning them to the store from where they were purchased. Consuming listeria can lead to the illness listeriosis, which can cause a high fever, severe headache, a stiff neck and nausea. Listeriosis can also lead to premature delivery or miscarriage in pregnant women and can be a serious illness for those with weakened immune systems.